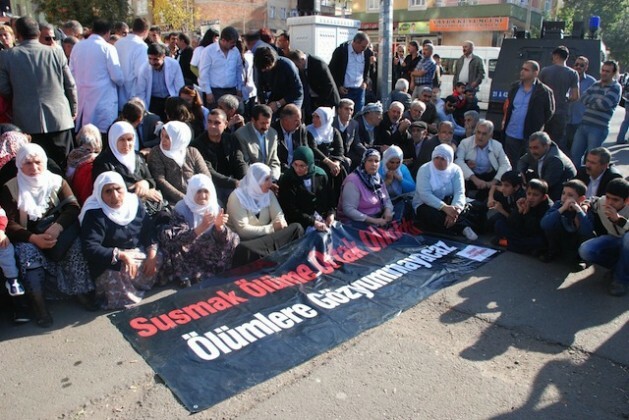 Protesters gather in the Kurdish-populated city Diyarbakır in southeastern Turkey. Credit: Ahmet Ün/IPS. DIYARBAKIR, Nov 13 2012 (IPS) - Five MPs from Turkey’s main Kurdish political party, the Peace and Democracy Party (BDP), and the Mayor of Diyarbakır have gone on hunger strike to support a protest by more than 700 Kurdish prison inmates. The prisoners’ hunger strike has now lasted 63 days, and spans dozens of prisons across Turkey. Among their demands, the prisoners are seeking the right to use the Kurdish language in court and in schools, and to bring an end to the solitary confinement of Abdullah Öcalan, founder of the Kurdistan Workers’ Party (PKK), a separatist group that has been internationally dubbed a terrorist organisation. They are also demanding that the Turkish government resume negotiations with Öcalan – who is currently serving a life sentence on the prison island Imrali – for resolution of the Kurdish issue. An estimated 30 million Kurds reside in the region of Kurdistan, a contiguous area comprised of parts of Iran, Syria, Iraq and Turkey. Kurds in Turkey, who make up roughly one-fifth of its population, have suffered decades of systematic discrimination and forced assimilation, which went so far as to involve bans on Kurdish music and literature. By the early 1980s, a liberation movement spearheaded by the PKK was set in motion, paving the way for what would become a highly politicised armed struggle for Kurdish independence. Violent clashes between the Turkish military and the PKK peaked in the 1990s. Its founder, Öcalan, was captured in 1999. But to this day, tensions remain high as Kurdish separatist groups continue to fight for autonomy and the reinstatement of the Kurdish identity. And while the current administration under Prime Minister Recep Tayyip Erdoğan has fulfilled some of its promises to provide more constitutional freedom to Kurds in Turkey, the government has ceased talks with the PKK as they attempt to solve the Kurdish issue. It is the PKK’s inclusion in this process, under the leadership of Öcalan, that the hunger strikers seek. Mixed responses from the Turkish government have left protesters and parliamentarians alike unclear as to how this situation is going to be handled and the demands addressed. On Oct. 31, at a press conference in Germany, Erdoğan appeared to minimise the hunger strike. Earlier that month, justice minister Sadullah Ergin had indeed visited inmates at Sincan prison in the Turkish capital Ankara – but he did not paint the same picture Erdogan had described. He reported that 680 people were participating in the hunger strike and that no one was in critical condition, but nonetheless pleaded with prisoners to, “give up these actions…for your own health, for your families who love you, and for those who you love. Former PKK member Hamit Kankılıç participated in a “death fast” in 1982 while completing a 20-year sentence at Diyarbakır prison in southeastern Turkey, an institution famed for its poor conditions and torture of inmates. Kankılıç and his fellow prisoners set out their demands and followed them up with a “death fast”, where even water is not ingested and death occurs much sooner than it would in a hunger strike. And as many hunger strikers enter their ninth week without food, the possibility that fatalities will occur is that much greater. Dr Muna Saloman, health and education programme manager at the U.S.-based organisation Turkey Human Rights Watch, urges medical intervention at this stage of the hunger strike. “Now they are in danger, because no one can tolerate starving for a long period of time,” she says. And there are questions about what damage the government’s reaction to the hunger strikes will do to already strained Kurdish-Turkish relations. There may be decades of armed struggle between the two groups, but Kankılıç sees these protests as a step in the right direction for peaceful resolution of the Kurdish issue – a new aspect to the struggle which he believes should be acknowledged by the Turkish government.